We’ve all heard of Long Island Iced Tea cocktails, but they don’t actually have any tea in them! 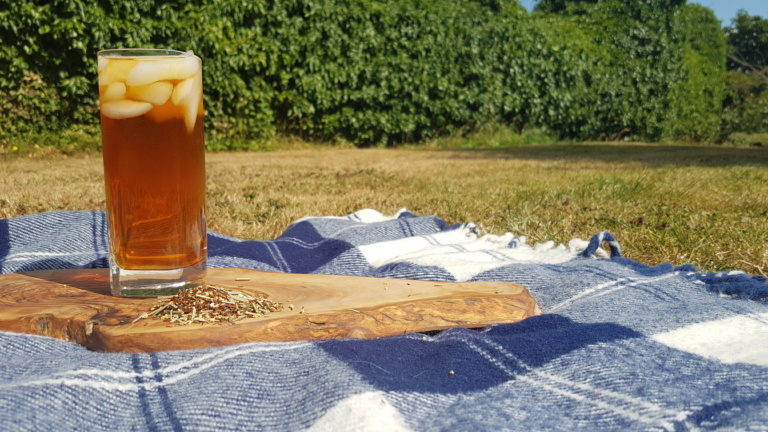 This summer has been a scorcher so far and naturally as tea lovers (and over 18s!) we decided to try adding a little alcoholic twist to our cold brews! The results were delicious and so we’ve decided to share them with you! For each suggestion we cold brewed our iced teas either over night or during the day. To learn more about the various ways you can make your iced tea see our previous blog here! Our Granny’s Garden fruit tea is a delicious blend of red berries and hibiscus. It works beautifully as an iced tea and has a natural tartness to it. We’ve discovered that this is complimented very well with a dash of vanilla vodka! Once your iced tea is ready: Add the vodka to your glass; you can use one or two shots depending on how strong you like it. Add the ice and any berries that you would like to decorate it with and top with the iced tea. Finally give your drink a good stir to make sure everything is nicely mixed. If you want to add a little fizz to your drink fill the glass 2/3s of the way up with your iced tea and top with either soda water or lemonade. Gin cocktails have become a firm favourite amongst people throughout Bath (our home town!) and the rest of the UK. There’s a wide variety to choose from with lots of different teas matching various types of gin, depending on what flavours you enjoy. We love our refreshing Rooibos Elderflower and lemon grass blend and have found it goes particularly well with London Dry Gins! Once your iced tea is ready, add your gin to your glass (one shot or two, it’s up to you! ), fill your glass with ice and top with your iced tea. Give it a good stir to make sure everything has mixed well. You can add extra lemon slices or a drop of lemonade to your drink if you want a stronger citrus flavour. A twist to the classic Mojito cocktail! On a hot summers afternoon we’ll often drink a pot of our Moroccan Mint green tea. The refreshing flavour is often just what we need! 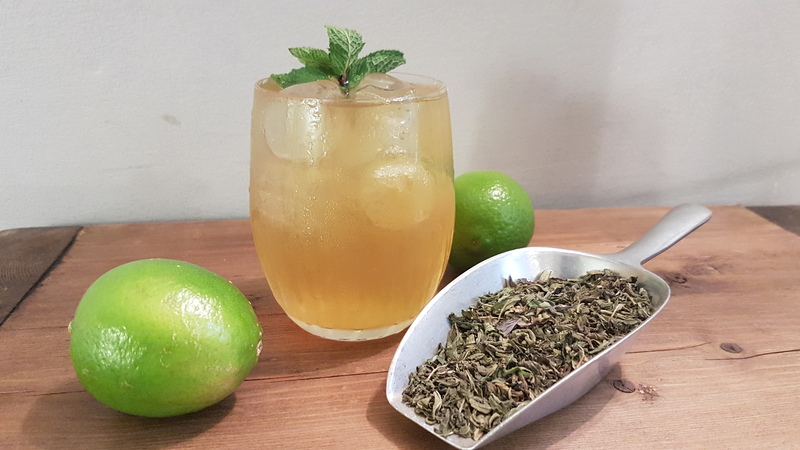 For an evening iced tea cocktail we’ve used this in house favourite combined with the classic Mojito recipe! Once your iced tea is ready: Add a couple of lime wedges and a tea spoon of brown sugar to your tumbler glass. Muddle them (give them a good squish to grind the sugar and release the lime juice), add your rum (normally 2 shots), add ice and top with your iced tea. Stir your cocktail to make sure everything mixes well. We added an extra sprig of fresh mint and lime as a garnish to get the full cocktail feel. If you prefer your drink to have a fizzy touch to it. Only fill your glass with 2 thirds of iced tea and top with either soda water or lemonade. 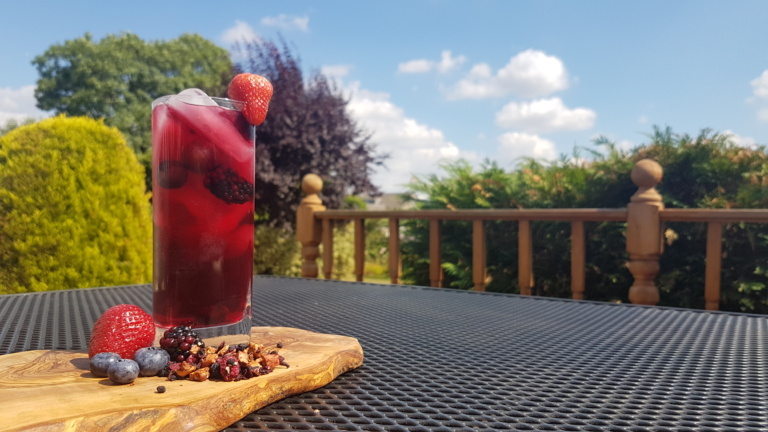 If you’re looking for a new kind of refreshing drink for an evening BBQ or a garden party why not try one of these ice tea cocktails! We love seeing your experiments with our teas! Let us know how they go by sharing your experience on facebook, twitter or instagram!